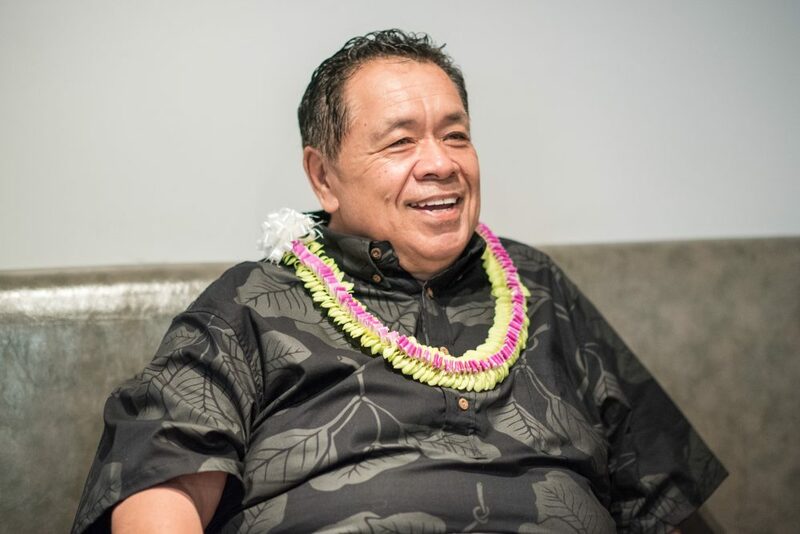 Sam Choy is a James Beard Award-winning restaurateur, chef, and the “godfather of poke.” Before a Zócalo/Daniel K. Inouye Institute “Pau Hana” discussion titled “Why Is the Mainland So Fascinated By Hawaii’s Food?” at Artistry Honolulu, he spoke in the green room about becoming a great pot washer, his favorite comfort foods, and his ideal dinner-party guests. Was there an experience that made you decide to become a chef? You know, it was from the get-go with our parents. They introduced us to food from way back when, and as we got a little older and [were] educated to go out to restaurants—because we didn’t have many at that time. But we got to order, and what we ordered, we ate. What do you remember ordering? I remember going to a place called Crouching Lion on the North Shore, and just having like a steak and lobster was like really interesting, you know? And my dad was a heck of a chef, and my mom [as well]. His whole thing was [about the importance of] preparing food, from the beginning, and then to finish it at the end. What I mean by that is, the way you prepped it, it was all organized. Everything looked beautiful—like a salad or whatever—and then as he put it together, it unraveled to a real masterpiece of food. So that’s when I got hooked at a very young age. I learned from my parents in their kitchen. Is there anyone else who really influenced you, maybe another chef? Walter Schiess, he was from Switzerland I think. He taught me like general kitchen organization, cooking, and kind of getting us ready for the next level. I think one of the real nice things that happened to me is that I was hired as a cook’s helper, but I ended up not being a cook’s helper and that kind of set me back psychologically, a little bit, when I was really young. And I became a pot washer, and I ended up leaving work that day and going to my mom. And she asked me, “So how was your first day of work?” and I said, “Well, my first day of work is done. I’ve quit, I’m not going to go back and be a dish washer.” And she sat there for five minutes—I was sitting in my Volkswagen [Beetle] on the North Shore—and she said, “You know, maybe in your career, that might be very important for you to learn to be the best dish washer. Because after you accomplish that, then you can move on to another thing. You want to learn it all.” Let me tell you, she turned me around in that 10 minutes of conversation, and it has never stopped since. If you could pick any four or five people, past or present, for a dinner party, who would you have? Well, I would definitely have my wife, my two boys. And then, if I could turn back time, my parents. How about a non-family member? I’d love to cook for Bruno Mars, one of Hawaii’s own. He’s a Roosevelt [High School] kid, went through a lot of hard times, and paid his dues—work ethic is amazing. Respectful to people. He just has all the makings of a person that was born and raised in Hawaii. He’s kind of like one of our style, one of our people. I mean, look at me! Do I look like I only eat salad?! [Laughs] You know, it’s things that my mom and dad cooked. Like my mom did this fantastic pot roast, and then she did a cream chicken, which is kind of like chicken and dumplings but without the dumplings. And we still do it, and every time we do it we go, “There’s mom, at her best.” Then my dad did a lot of vegetables. He was a stir-fry master…. Those are the things that I can really take to the grave with me. I like to be just in a car driving somewhere nice where we live on Hawaii island, on the Big Island. Unfortunately, the volcano is really tearing it up right now, but that’s Mother Nature. Yeah, we’re fine, it’s just the air conditioning is bad. It’s like being on Mars. I haven’t been to Mars, but you can more or less know all the fog and all the ash and things like that. So I like doing that, and of course travel—I travel a lot, we travel a lot. I’ve been around the world several times. Traveling’s great, but it’s always nice to come home.